“…what’s up with this wine and would you please leave one on the shelf for me to try?” She smiled, said it was very good and kind enough to leave me a bottle to take home. Since then, I've been back for plenty more! In general, I’m an oaky, buttery, Chardonnay fan. Kendall Jackson Chard. has always been a good-old standard in the house although I think I’ve found an equal contender for slightly less $$. You’ll find soft aromas of pear and green apples followed by flavors of peach, pineapple and ripe melon. With a favorite finish of mine being toasty oak and a light buttery flavor, your palette won’t be disappointed. The remaining flavors on the finish are slightly sweet followed by a tart aftertaste, which fades quickly, revealing an easy drinking and quite refreshing wine. I would recommend chilling your bottle in the refrigerator for an hour or more as it should be served chilled. If you’re in a hurry, make up an ice bath (ice & water) in your wine bucket and place the bottle in there for 15-20 minutes (with some twirling of the bottle every few minutes). 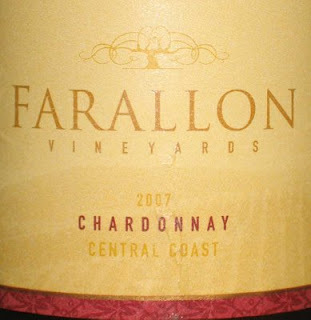 I had this wine with parsley, breaded seared scallops, porcini/roasted red pepper orzo, sauté spinach in olive oil & garlic and a salad of fresh picked tomatoes, cucumbers, yellow peppers and scallions in an olive oil & balsamic dressing. Yes…I made the dinner so the enjoyment of the wine was even better! I could see this wine as a great intro. to spring or summer paring it with grilled salmon or a pasta dish like Fettuccini Alfredo. Hey Dad, you’ll love this one with your favorite Carbonara. This use to be my go to Chardonnay. I found it very smooth to drink, and it was a little heavy on the oak, which I like. I say "was", as I understand from my wine store that the vinyard closed mid 2009. However, I keep hoping that the whole world is wrong, and that I will find a supplier.